If you read this blog as much as I do you would know that I am a firm believer in the power of personality and how important it is for companies to not only have one but let customers or clients see that they have one. 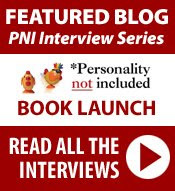 Rohit Bhargava, writer of the Influential Marketing Blog, agrees with me…or maybe he had come to this conclusion without my help because he has written a new book (available April 25th) called Personality Not Included. Since I am a huge fan of Rohit, his blog and his new book I am pretty jazzed to have had him answer a few questions on the subject of personality….just for you….by beautiful readers! Saul Colt: Can a super big company have a true personality or is it more a corporate image? Rohit Bhargava: One of the ideas I share in the book is that size is not the major determinant of personality. For example, there are many small businesses that don’t have a personality and large organizations that do manage to have one. In the end, it comes down to how you end up fostering it from your employees. SC: Can a company have its own organically derived personality or are they usually an extension of the founders personality? RB: This is a question that I actually focused on trying to have a good answer for in the book. To do that, Chapter 2 is all about the idea of the “Accidental Spokeperson.” One of the insights in that section is that the personality can absolutely grow from an individual or a set of individuals instead of the founder of an organization. There are many places that this identity can “accidentally” come from … the main point is that you need to recognize this and reward it. SC: Why write a book on personality? Is this something you can teach? RB: The main reason is because I believe it is greatest trend in business that no one is talking about. We are talking about components of it, like social media or authenticity or word of mouth, but personality is a way to bring all those concepts together. The other reason was that I felt it was a new and ownable idea that hadn’t already had too many books written about it. That not only makes it more interesting, but makes it more likely that people will find it useful. SC: This may be a Chicken/Egg question but what comes first…the personality or the fan base?…and can you tailor your personality to match your biggest ambassadors? RB: You should absolutely be open to tailoring your personality to match what your customers are excited about. Sometimes, particularly when it comes to new brands, there is a temptation to define what you stand for after you talk to customers. This may seem like a chicken & egg situation, but your brand needs to stand for something before you can foster brand ambassadors. You can always change it, but you need to start somewhere. SC: If a company is evil, does that count as their personality? RB: Hmmm, thinking of any company in particular? You’ll be really interested in Wired’s cover story this month about Apple, because it essentially asks the exact same question … profiling how Apple manages to do well while being decidedly “evil” in their approach to business and secrecy (vs. the open source ideals of the rest of the valley). In their case, I’d say they do a good job of being both evil and innovative, simultaneously – so the answer to your question would probably have to be yes! Oh ya an Rohit answered a bunch of questions from a bunch of other people as well. Follow the link to read a few more and if you are interested in this topic I recomend you picking up the book!